Kota Tinggi, Johor has a very rich history and many interesting tourism spots. It occupies about 3500 square kilometre and is the biggest district in Johor. Almost 200,000 people live in this district. ‘Johor’ comes from the word ‘Jauhar’, a precious gem, while the word ‘baru’ means new and ‘lama’ means old. This explains how the new capital city ‘Johor Baru’ got its name. The old capital of Johor, called Johor Lama, is situated in Kota Tinggi. Today, Johor Lama is a little and quiet fishing village . Many Bugis families who came from Indonesia, perhaps during Portugese time, are still living there. They have been assimilated to the local Malay culture. Each year, about 30,000 people visit Johor Lama. The village has many unique wealth. Besides, its abundant artefacts that draw excavation work from various organizations, a small island located just opposite its main jetty has been a home for hundred of egrets over the last decades. At around 7 to 7:45 p.m., groups of egrets would be flying back to their home in multiple directions. Watching them flying and seating on the trees is a spectacular and special experience. One may also travel to egrets home island by cruising along Johor River from Kota Tinggi city. Along this river lies down the longest river bridge as well the longest single plane cable-stayed bridge in Malaysia (picture below). The River Johor bridge connects Senai-Desaru Expressway, a project under Iskandar Malaysia development. Interestingly, Johor is the most southern point of the Asian continental mainland. The cruise along the river of the southern gateway to Malaysia and Asian continental mainland features beautiful sites of mangrove areas and greenery. However, one may also be disturbed with the huge sand dredging ships that are actively deepening the Johor river in order to support construction and development needs locally and across the straits. The list is very long. In addition to these unique places, Kota Tinggi people are also very hospitable and kind to their guests. Many tourists who stayed at different homestay in Kota Tinggi commented positively on the warmth and great hospitality of their host parents and homestay villagers. There have been many talks on interesting future tourism projects in Kota Tinggi. One of them is developing Desaru into what Nusa Dua in Bali was now – an enclave of large international resorts. This news excites many holiday makers, local folks and business people. The proposed plan is to build two international hotels, a world class golf resort, a theme park and a convention centre. Such tourism projects will create job opportunities and draw more tourists. The coming petrochemical projects in Teluk Rumania and Pengerang too will indirectly increase the flux of tourists to Kota Tinggi. One valid and important question that needs to be addressed urgently is on sustainability of the rich biodiversity in Kota Tinggi throughout a rapid development. As a company that advocates peace to the environment, DL2GO, welcomes holiday makers to be ethically responsible during their holidaying in Kota Tinggi. But yet, wishing them not to miss the fun while touring and relaxing! 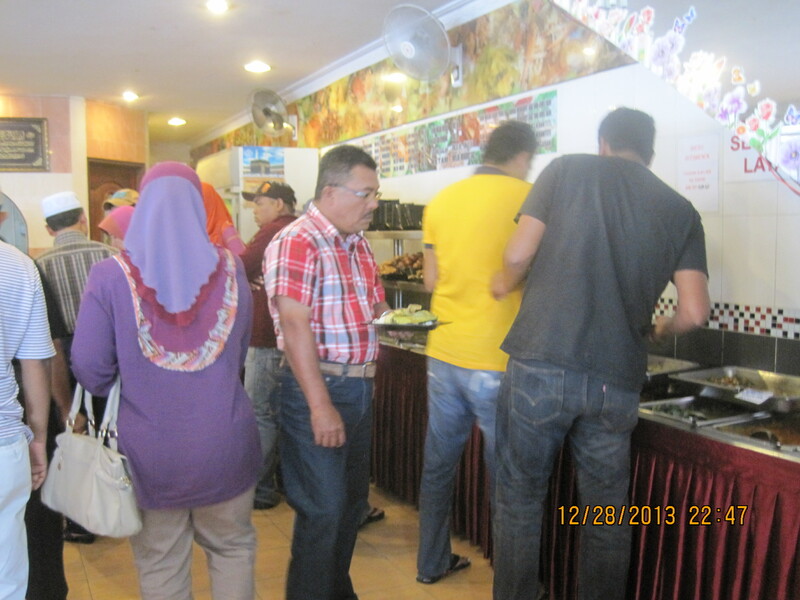 There are numerous restaurants that serve delicious local dishes in Kota Tinggi. The list is very long, and below are some of them. The city is rich with local delicacies of authentic Malaysian cuisines. It also includes ‘fusion’ menu, a blend of recipes originally popular among some ethnicity that is now concocted into one recipe. For example, today the traditional Indian drinks called chendol; traditional Chinese Hainan chicken rice and the Malay delicacy Nasi Lemak (coconut milk rice) are prepared and served in various versions and sold in many restaurants owned by any Malaysian, regardless of their ethnicity. One example of fusion menu is ABC or ‘Air Batu Cendol’ – a nice cold drinks made of grinded ice, topped with red syrup, chendol, corn, red beans, etc. It is a nice refreshing drinks for hot weather climate such as Malaysia. 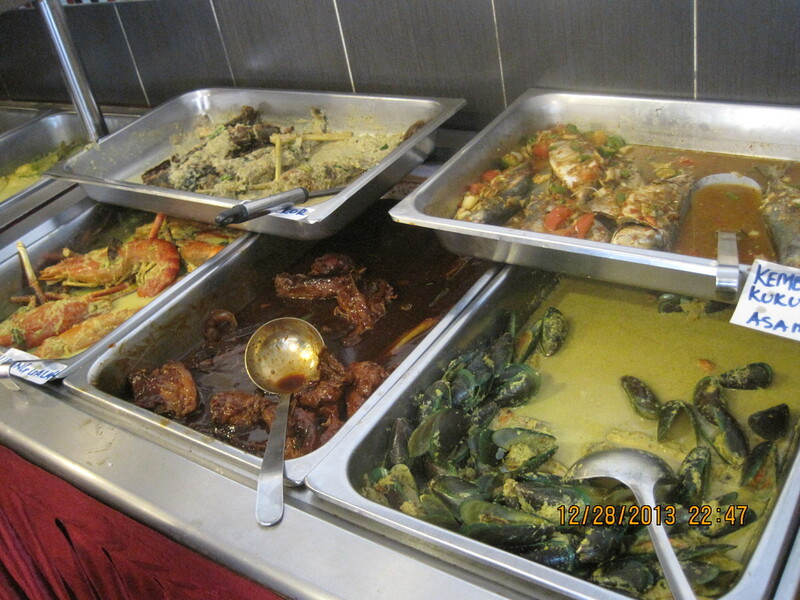 Restaurant Haji Daud (RHD) – Serve the widest varieties of traditional Malay dishes in town! Prices: A rice meal with fish, chicken & 2 vegetable dishes is around RM10 to 15. Fried rice, fried noodle, soups, tom yam, sea food dishes all offered at reasonable prices. However, watch out for ‘udang galah’ RM40/each! Special Note: A great place to experience local Malay Muslim culture in Malaysia. Eating with fingers are well accepted here. The restaurant often plays preaching videos from well known local Muslim preachers (please bear its volume level). Mama Jeli Recipe Food Stall – Original recipe of local delicacies offered in set menu, reasonable prices and fast service. Special Note: A great place for lunch when travelling from Kota Tinggi town to Desaru or Tanjung Balau beaches.